Trading Hours: Open Daily*: 10am – 5pm; Café open 9.30am – 4pm (*Closed Good Friday, Christmas Day & Boxing Day). FREE Admission. 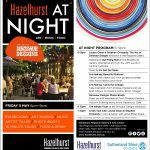 Hazelhurst Regional Gallery & Arts Centre is a spectacular arts complex offering exhibitions, art courses and workshops, artist talks and special art events. Set amid extensive landscaped gardens, the combination of a major public gallery and community gallery with a comprehensive arts centre, state-of-the-art theatrette, gallery shop and terrace Café is quite unique providing a “complete creative” resource. Over 15 national and international travelling exhibitions are presented in the regional gallery annually, whilst the community gallery exhibits and sells local artists’ work in a regularly changing program. Workshop studios include a fully equipped New Media studio, print workshop and ceramics studio with the original Hazelhurst cottage on the grounds utilised as an artist-in-residence space. The theatrette hosts a regular programme of films, performances and lectures.